In an effort to improve my sleep patterns, i’ve decided to start measuring them. Let’s face it, sleep is something most of us could do with more of. 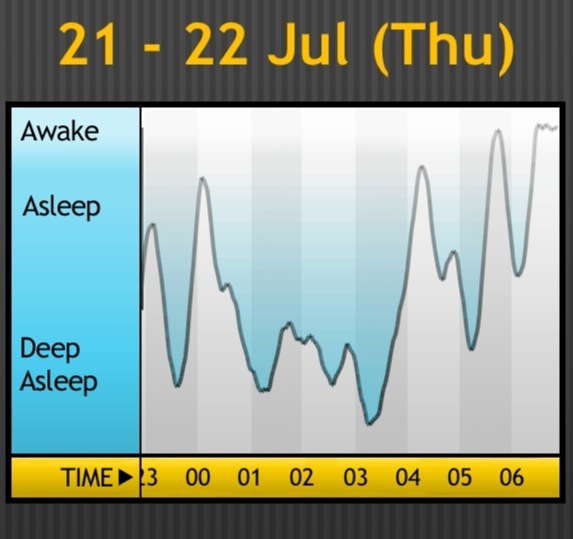 Above are my sleep statistics for 21 – 22 Jul (Thursday night). I went to bed at 22:55 and woke at 06:54. An alleged total time of 7h 59m. I’m amazed how many times I wake in the night but at this time this is only really a sample size of one night. It appears that the most valuable portion of sleep comes between 01:00 and 03:00 where I dipped into a deep sleep three times. It’s not unusual for me to be heading to bed between 01:00 & 03:00, which can’t be good for the much needed R.E.M sleep portion of my night. So far I’m thinking my attempt at an early night was a step in the right direction. Although I’m writing this on my phone, still in bed, I certainly feel a little more awake than I normally do. I wonder what a night starting with a 22:00 bedtime would look like? Also would reducing my caffeine intake increase the length of periods of deep sleep. All this to find out and more I guess. 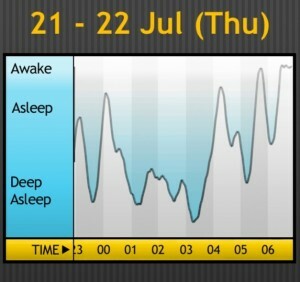 Analysis was made using the Sleep Cycle iPhone app. Thanks to Gia Rossini for reminding me of it’s existence during a G+ conversation. If you can sleep with headphones in the this app is worth a look as well – http://itunes.apple.com/gb/app/100-binaural-beats-tones!/id403862462?mt=8 It uses binaural beats (pulsing noises) to alter your brainwaves. I listen to audiobooks while I sleepand this works in the background. It has different settings such as power nap & deep sleep and also a 12 minute cycle to take you from wakefulness to deep sleep. I’ve found that it works brilliantly. Cheers @iamkat Not sure i can sleep in headphones but i’ll check it out.